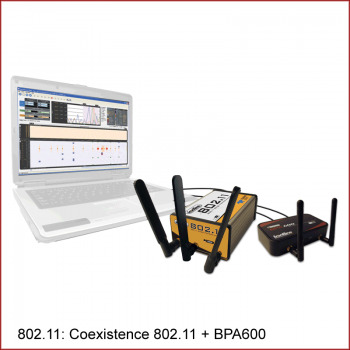 The precise and comprehensive analysis tool to inspect 802.11 and Bluetooth over 802.11 wireless communications. • the 802.11 a/b/g/n hardware interface (ie. the “yellow” box). See also Datasheet [Attachments tab]. The Frontline 802.11 protocol analyzer lets you passively capture wireless traffic like never before. 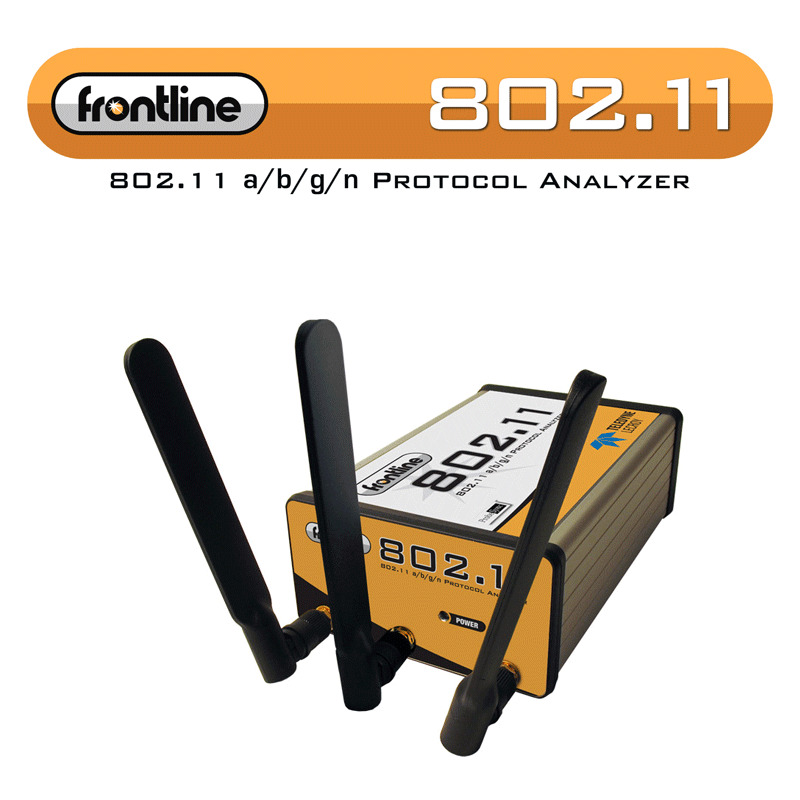 No other device on the market provides the precision, reliability, or capacity to gather wireless data better than the Frontline 802.11 protocol analyzer! The sheer volume of 802.11 data flowing between devices can be staggering, but gone are the days when you missed or dropped large numbers of packets because your analyzer simply couldn’t keep up with the amount of data flowing through the air. Frontline has met the challenge head-on by building into the Frontline 802.11 analyzer a staggering ~250GB data buffer. The ComProbe 802.11 introduces a new level of precision regarding timestamps and Bluetooth Coexistence. 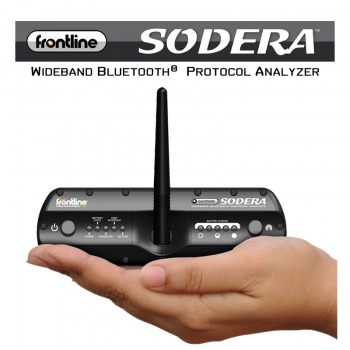 Now developers can connect the ComProbe 802.11 analyzer with the Frontline BPA 600 or Frontline SODERA using Frontline's ProbeSync™ technology - enabling two or more analyzers to share a common clock. Once connected developers can clearly see both 802.11 packets and Bluetooth 4.0 or 5 +HS packets together in one coexistence view. The analysis of 802.11 and Bluetooth data packets in one view is possibly one of the most challenging tasks for wireless device developers. Capturing the precise timing, size, and frequency of each and every packet is essential to successfully developing and debugging devices using both technologies, and until now has been, at best elusive. Get the Data You Need - See ALL of the data ALL of the time and never drop a packet. Capture 100% of the data with our built-in ~250GB buffer. Bluetooth Coexistence is a snap! 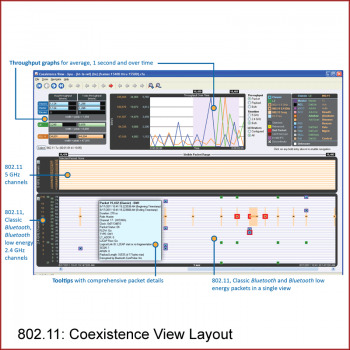 - The coexistence view combines 802.11 and Bluetooth 4.0 or 5 +HS packets into one view with precise timestamp synchronization using Frontline's ProbeSync technology. 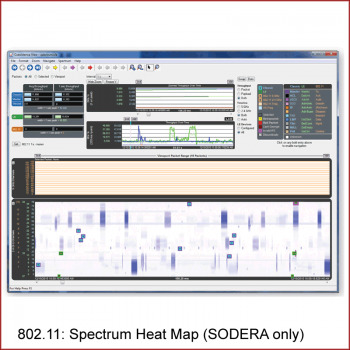 Analyze devices using the spectrum of 802.11 protocols - 802.11 a/b/g/n support means you don't have to wonder if an 802.11 protocol is supported. 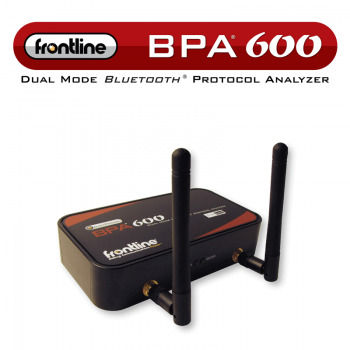 The Frontline 802.11 Protocol Analyzer includes the portable and robust 802.11 a/b/g/n hardware interface (note: ie. 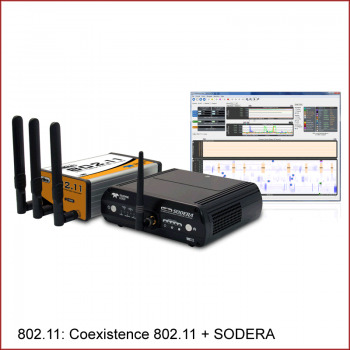 the yellow box depicted above), which supports connectivity to 802.11 wireless communications. 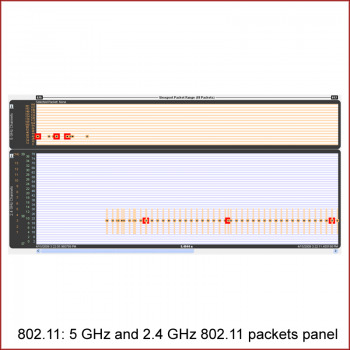 The 802.11 a/b/g/n hardware interface is one member of an extensive arsenal of technology-specific hardware interfaces, all functioning with the powerful Frontline software. This modular approach allows greater flexibility in protocol analysis and debugging, and provides comprehensive views over virtually any combination of protocols. Modulation 802.11a: OFDM (BPSK, QPSK, 16-QAM, 64-QAM) 802.11b: DSSS (DBPSK, DQPSK, CCK) 802.11g: OFDM (BPSK, QPSK, 16-QAM, 64-QAM) 802.11n: OFDM (BPSK, QPSK, 16-QAM, 64-QAM).